Tokyo is located on the southeastern side of Japan. 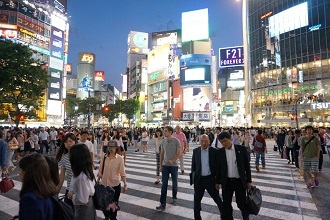 Tokyo is known as Japan’s busy capital that blends together the ultramodern and traditional. One of the best ways to capture Tokyo’s modern-traditional mixture is to visit Meiji Shrine in Harajuku. Meiji Shrine is one of the most famous Shinto shrines in Japan and is nestled in a thickly wooded area. Right outside of the first gate, however, is Harajuku’s famous Takeshita street. All along Takeshita are unique fashion stores, popular chain restaurants and people dressed in vibrant colors. A popular traditional attraction is Sensoji temple in Asakusa. Sensoji is the oldest Buddhist temple in Japan, dating back to its completion in 645. Visitors enter through the picturesque Thunder Gate that welcomes you into the busy shopping street, Nakamise. Amongst the two streets that lead straight to the large temple are shops that sell Japanese souvenirs such as folding fans, local snacks, and the summer kimonos, yukatas! Tokyo’s version of comfort food is monjayaki. This Japanese style pan-fried batter consists of similar ingredients to okonomiyaki, such as cabbage and flour, but it’s runnier because of the fish broth that is added. Some common toppings are meat, seafood and cod roe!